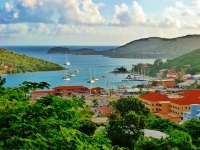 Charlotte Amalie, named in honour of the wife of King Christian V, is the Danish-flavoured capital of the US Virgin Islands, a busy port and important merchant centre since the 18th century. The beautiful harbour is ringed with whitewashed houses and painted villas, their red roofs a splash of colour against the green hillside. Cobbled, Danish-signposted streets and alleyways lead down to the waterfront lined with shops, boutiques and colonial architecture. The old Danish merchant warehouses form a world-famous shopping district, selling imported goods from around the globe. The harbour is usually filled with cruise ships, ferries, yachts and fishing vessels, and is one of the most visited ports in the Caribbean, creating a tourist hub that is vibrant and multinational, but often overcrowded. For those weary of duty-free shopping, Charlotte Amalie offers numerous other attractions, as well as elegant restaurants and an exciting nightlife. Blackbeard's Castle on top of Government Hill offers superb views over the harbour, and is said to have been the lookout tower for the legendary pirate, Captain Blackbeard. The red brick Fort Christian is the oldest standing building on the island, where Danish soldiers stood guard against pirates and invaders. The fort has served as a jail, church, government house and community hall in its long history and today houses the Virgin Islands Museum.